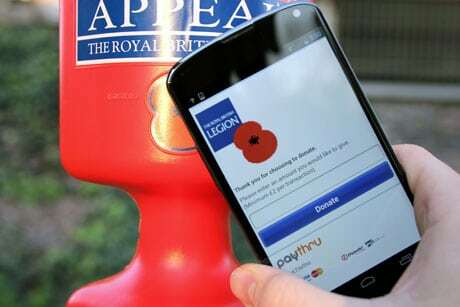 The Royal British Legion has used NFC to make it easier for consumers to make a donation to the 2013 Poppy Appeal, in partnership with Proxama and mobile commerce and marketing platform Paythru. For Birmingham’s Poppy Day on Tuesday this week 20 collection tins and 12 posters in five locations — Victoria Square, New Street Station, Snow Hill Station, Queen Elizabeth Hospital and Birmingham Airport — were equipped with NFC tags, allowing the public to ‘tap the poppy’ on the tins or posters to make a donation to the charity. When consumers tapped the tags, they were redirected to a website where they chose the amount of their donation and filled out their bank details for the payment. QR codes were also used for those without an NFC smartphone. “It is great to be working with Proxama and Paythru on the Poppy Appeal,” says Claire Rowcliffe, Midlands regional fundraising manager for The Royal British Legion.